1703: recorded as performing in Kyôto as a wakaonnagata in Kyôto. 11th lunar month of 1704: Takie played in Kyôto at Miyako Mandayû's theater the role of Takenoyo in Chikamatsu Monzaemon's drama "Kisshô Tennyo Anzan no Tama". Fall 1707: Takie went to Ôsaka to perform in the kaomise program which was produced by Iwai Hanshirô II. 1st lunar month of 1708: Takie's rank in the Ôsaka hyôbanki, wakaonnagata section, was jô (superior) [visual]. 11th lunar month of 1708: Takie played the role of Iori's nyôbô in Ôsaka in the kaomise drama "Tate Eboshi Daijin Bashira". Fall 1710: Takie went to Edo. 11th lunar month of 1710: Takenojô played at the Ichimuraza the role of Minase-no-Mae in the kaomise drama "Shusse Taiheiki", which celebrated the shûmei of Takii Hanshirô. 18th day of the 12th lunar month of 1710: a fire broke out in the somptuous palace of the daimyô Sanada, located in the district of Koyanagi-chô. It destroyed both the Nakamuraza and the Ichimuraza. 3rd lunar month of 1711: Takie's rank in the Edo hyôbanki, wakaonnagata section, was jô-jô (superior - superior) [visual]. 11th lunar month of 1711: Takie performed at the Ichimuraza in the kaomise drama "Shusse Taiheiki". 3rd lunar month of 1712: Takie's rank in the Edo hyôbanki, wakaonnagata section, was jô-jô-(shiro)kichi (superior - superior - (white) excellent). [visual]. Winter 1713: Takie went back to Ôsaka. 11th lunar month of 1714: Takie performed in Ôsaka in the kaomise drama "Bandai-ga-Ike no Tsurukame", which is produced by Arashi Sanjûrô I at Shioya Kuroemon's theater. 1st lunar month (spring?) of 1715: first Kabuki adaptation of Chikamatsu Monzaemon's drama "Daikyôji Mukashi Goyomi", which was entitled "Daikyôji" and was staged in Ôsaka; Takie played the role of (Osan's ?) mother [casting]. 11th lunar month of 1715: Takie played in Ôsaka the role of Komatsu in the kaomise drama "Seiwa Genji Kaichû Fude", which was produced by Arashi Sanjûrô I. 11th lunar month of 1716: Takie played in Ôsaka at the Higashi no Shibai the role of Chikara's nyôbô Ochiyo in the kaomise drama "Futahashira Kasen Kagami". Fall 1717: Takie went to Kyôto. 11th lunar month of 1717: Takie played the role of the female shisha Naniwa no Komatsu in Sakakiyama Kansuke I's kaomise drama "Ômu Gaeshi Momotose Gitsune", which was produced by Sakakiyama Shirotarô I at Hayagumo Chôdayû's theater; his stage partners were Shibazaki Rinzaemon I, Yamada Jinpachi, Bandô Hikosaburô I, Sawamura Otoemon I, Sakakiyama Koshirô I, Katayama Kozaemon, Matsushima Moheiji, Bandô Matajûrô I and Onoe Samon. 11th lunar month of 1718: Takie played in Kyôto at Hayagumo Chôdayû's theater the role of Arima no Kofuji in the kaomise drama "Chôseiden Kogane no Ishizue", which was produced by Sakakiyama Shirotarô I. 1st lunar month of 1720: Takie's rank in the Kyôto hyôbanki, wakaonnagata section, was jô-jô-(hanshiro)kichi (superior - superior - almost excellent) [visual]. He shared the same rank with Yamamoto Kamon and Sodesaki Wakaura I. Takie played in the same theater the role of Sanzaemon's goke Koyano the new year ni-no-kawari drama "Keisei Mizoro-ga-Ike". 2nd lunar month of 1720: Takie's rank in the Kyôto hyôbanki, wakaonnagata section, was jô-jô-kichi (superior - superior - excellent) [visual]. He shared the same rank with Yamamoto Kamon and Sodesaki Wakaura I. 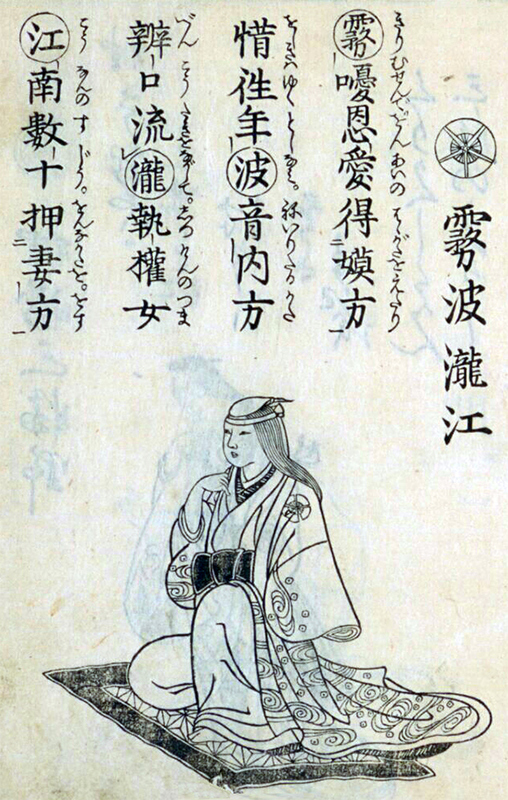 11th lunar month of 1720: Takie played in Kyôto the role of Kumoi in the kaomise drama "Jûni Chôshi Megumi no Kodakara", which was produced by Sakakiyama Shirojûrô. 11th lunar month of 1721: Takie played in Kyôto at Miyako Mandayû's theater of the role of Banjûrô's nyôbô Oshige in the kaomise drama "Inari Fuku In'yô no Kanegura", which was produced by Sawamura Chôjûrô I (who played the role of Inamura Banjûrô). 11th lunar month of 1722: Takie played in Kyôto the role of Tôzô's nyôbô Kasen in the kaomise drama "Senbon Matsu Tokiwa Yakata", which was produced at Hayagumo Chôdayû's theater by Sakakiyama Shirotarô I and welcomed in Kyôto the Ôsaka star Anegawa Shinshirô I (who played the role of Tamagaki Tôzô). Fall 1723: Takie went to Ôsaka. 11th lunar month of 1723: Takie played at the Ônishi no Shibai the role of the female fortune-teller Koyuki, in reality Sagoemon's wife, in the kaomise drama "Fukujukai Kogane no Minato", which was produced by Sakakiyama Shirotarô I. 1st lunar month of 1724: Takie's rank in the Ôsaka hyôbanki, wakaonnagata section, was jô-jô-kichi (superior - superior - excellent) [visual]. He shared the same rank with Sanogawa Mangiku and Ichimura Tamagashiwa I. 11th lunar month of 1724: Takie played at the Ônishi no Shibai the role of Tamamatsu's nyôbô in the kaomise drama "Senbon Matsu Hi-no-De no Maizuru", which was produced by Sakakiyama Shirotarô I and Sawamura Kiyojûrô. Fall 1725: Takie went to Kyôto. 11th lunar month of 1725: Takie played in Kyôto at Miyako Mandayû's theater the role of Sagoemon's wife Tatsuno in the kaomise drama "Sanpukutsui Eiga no Shikishi", which was produced by Mihogi Gizaemon I; the role of Tsurubayashi Sagoemon was played by Anegawa Shinshirô I. 1st lunar month of 1726: Takie's rank in the Kyôto hyôbanki, wakaonnagata section, was jô-jô-kichi (superior - superior - excellent) [visual]. He shared the same rank with Sanogawa Mangiku. 11th lunar month of 1726: Takie played at Kameya Kumenojô's theater (Kyôto) the role of the menoto Toyora in the kaomise drama "Karanishiki Imose no Shitone", which was produced by Matsushima Hyôtarô. 11th lunar month of 1727: Takie played at Ebisuya Kichirôbê's theater the role of Owari no Oyotsu in Azuma Sanpachi's kaomise drama "Tônai Tarô Danjiri Roppô", which was produced by Sanogawa Mangiku. 11th lunar month of 1728: Takie performed in Kyôto at Ebisuya Kichirôbê's theater in the kaomise drama "Mandai Toshigoyomi", which was produced by Kikukawa Kichitarô. 11th lunar month of 1729: Takie played the role of Gonzô's wife Tatsuta in the kaomise drama "Yomeiri Shichigosan", which was produced by Arashi Koroku I for the nadai Daikokuya Takenojô and welcomed in Kyôto the actor Sawamura Otoemon I (who played the role of Yamaoka Gonzô). 11th lunar month of 1730: Takie played in Kyôto at Kameya Kumenojô's theater the role of the goze Yamanoi in the kaomise drama "Eiraku Shiki no Kogane", which was produced by Sakakiyama Shirotarô I. 1st lunar month of 1731: Takie played in the same theater the role of Imai Sanzaemon's nyôbô Makino in the new year ni-no-kawari "Keisei Mikasayama". 9th lunar month of 1731: tour in Nagoya; Takie performed at the Seijuin no Shibai. 11th lunar month of 1731: Takie played in Ôsaka at the Kado no Shibai the role of Okyô in the kaomise drama "Aioi Kikenjô", which was produced by Arashi Kokuseki. 1st lunar month of 1732: Takie's rank in the Ôsaka hyôbanki, wakaonnagata section, was jô-jô-kichi (superior - superior - excellent) [visual]. He shared the same rank with Yamashita Kinsaku I, Sanogawa Hanazuma I and Yoshizawa Ayame II. Fall 1732: Takie went to Kyôto. 11th lunar month of 1732: Takie played in Kyôto at Kameya Kumenojô's theater the role of Koyurugi in the kaomise drama "Hayazaki Kogane no Hanabusa"; his stage partners were Ichiyama Sukegorô I, Arashi Kanshirô I, Nakamura Kiyosaburô I, Tomizawa Montarô I, Somenoi Hanshirô, Matsushima Moheiji, Fujioka Daikichi, Shinozuka Kazaemon and Arashi Koroku I. 1st lunar month of 1733: Takie's rank in the Kyôto hyôbanki, wakaonnagata section, was jô-jô-kichi (superior - superior - excellent) [visual]. He shared the same rank with Sanogawa Mangiku. 11th lunar month of 1733: Takie played at Kameya Kumenojô's theater (Kyôto) the role of Toyora in the kaomise drama "Chôseiden Kogane no Shikigawara", which was produced by Sakakiyama Shirotarô I. Fall 1734: Takie went to Ôsaka. 11th lunar month of 1734: Takie played at the Kado no Shibai the role of Tada Katsuemon's nyôbô Misaki in the kaomise drama "Shin Yakata In'yô no Ishizue", which was produced by Nakayama Shinkurô I; his others stage patners were Sawamura Otoemon I, Izumikawa Sennosuke, Tamiya Shirogorô (Tada Katsuemon), Yamashita Matatarô I, Kamakura Heikurô I, Asao Motogorô I and Matsushima Moheiji. 1st lunar month of 1735: Takie's rank in the Ôsaka hyôbanki, wakaonnagata section, was jô-jô-kichi (superior - superior - excellent) [visual]. He shared the same rank with Yamashita Kinsaku I, Sanogawa Hanazuma I and Yoshizawa Ayame II. No record afterwards. Kirinami Takie was a talented and popular Kamigata onnagata actor, who was active from the first half of the 1700s to the first half of the 1730s. He was a jô-jô-kichi actor from 1720 to 1735. Another possible reading could be Kinjô.